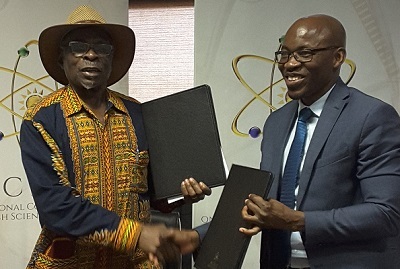 The convenor of the Namibia Alliance for Improved Nutrition, Hon Nahas Angula co-signed a Memorandum of Understanding earlier this week with the Chief Executive of the National Commission for Research, Science and Technology, to support the alliance with a comparative study of nutritional adequacy in the Bushmen communities. 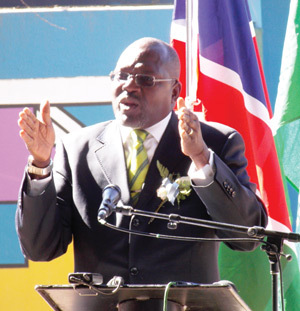 The science commission has pledged to support the alliance with a grant of N$100,000 and with conducting the survey to determine the nutrition status of San infants in Omaheke, Oshikoto and Otjozondjupa. The nutrition alliance, NAFIN, is a multi-sectoral, multi-stakeholder, non-profit association striving to promote good nutrition, especially among children below the age of five. Recently, the alliance received disturbing reports of acute malnutrition among the children of a San community near Drimiopsis north of Gobabis. This prompted the alliance to approach the science commission for support to undertake a study whether San communities show high or low instances of malnutrition compared to other indigenous groups. The survey will be carried out in collaboration with relevant ministries and regional authorities over a one and a half year period. The goal is to cover significant sections of the target communities within the given time frame. The survey will cover issues such as the attendance of ante-natal clinics by pregnant San women, the prevalence of anaemia among expecting mothers; the weight at birth of San babies; supplementary feeding for San babies; the housing and sanitation situation; the de-worming of San children; infant mortality in San communities and maternal health. The science commission said it will provide resources through the Research, Science and Technology Fund for co-funding of planned collaboration; manage the research and development grant and provide technical assistance were possible to the alliance.